Our aim is to get you well faster and for you to stay well for longer. The aim of the Back Pain centre is to provide safe, affordable and professional treatment designed so patients can receive a high standard of Chiropractic care within a modern relaxed environment. The focus has always been to provide a lasting solution through the discovery and treatment of the causes of pain and not just a quick fix by treating the symptoms. We also provide a high level of patient education so you will have the chance to find out exactly what has been causing you pain for so long, as well as giving you exercises to help maintain your physical well being. This will help to not only speed up your pain relief but will also minimise the chance of it returning by making you more aware of bad habits or aggravating factors. The Back Pain Centre is located just south of Oxford offering a professional Chiropractic service to the areas of Milton, Sutton Courtenay, Drayton and Abingdon. As the NHS was unable to accommodate my needs, it was suggested to try chiropractic treatment. The Back Pain Centre was recommended by a friend. 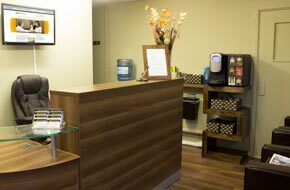 John and the staff have created a friendly and welcoming environment, which on the first visit, when not sure what to expect did really help to put me at ease. The treatment I received got me back on my feet and back to work. 10 out 10 for the clinic."